Knox led the Seahawks to the playoffs four times in the 1980s and a 12-4 record in 1984 that remains the second-best in team history. Knox had battled dementia and was in hospice care. The team confirmed his death Sunday. 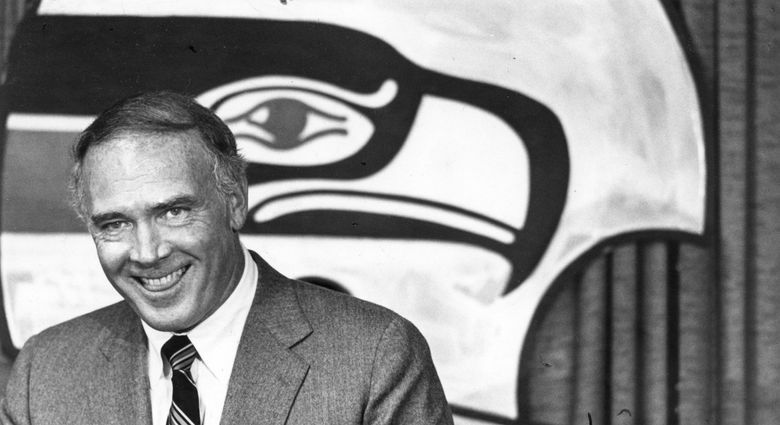 Chuck Knox, who led the Seahawks to their first playoff berth, a surprising run in 1983 to within a game of the Super Bowl in 1983 and is the second-winningest coach in franchise history, died Saturday at age 86, the team confirmed Sunday. Knox’s affinity for a run-first offense earned him the nickname “Ground Chuck’’ during a 22-year career as an NFL head coach that included stints with the Los Angeles Rams in the 1970s and ‘90s, the Buffalo Bills and Seattle from 1983-91. Knox was available after resigning as coach of the Bills – a team he had revived and led to two playoff berths in his last three years — following a contract dispute. With a demeanor that players called intimidating but fair, he quickly transformed a Seattle franchise that had not had a winning season since 1979 and had gone 14-27 in the previous three seasons into a perennial playoff contender that lit up the Kingdome throughout the 1980s. The Seahawks retired the No. 12 in 1984 as an homage to the decibel-record-setting crowds that greeted them every week. In Knox’s first major move as coach, the Seahawks moved up to the third overall selection in the 1983 NFL draft and took running back Curt Warner out of Penn State. Warner won Rookie of the Year honors and teamed with receiver Steve Largent and a defense led by safety Kenny Easley — both later named to the Pro Football Hall of Fame — to lead Seattle to a 9-7 record and wild-card playoff berth in 1983. Seattle then beat Denver in the wild-card round to set up what many consider the biggest upset in Seahawks history — a 27-20 win at Miami in the divisional round against a Dolphins team led by Dan Marino that had gone 12-4 and was an eight-point favorite. The Seahawks lost 30-14 to Oakland in the AFC title game a week later, but the two playoff wins set the stage for a run of four playoff appearances in six years. The 1980s was a decade when Seahawks football was the hottest thing in Seattle pro sports, with the Mariners barely relevant and the Sonics falling into a malaise following their only NBA title in 1979. Knox, though, was a far less conservative and far more adaptable coach than his “Ground Chuck’’ nickname might have indicated, as became evident during his second season in Seattle in 1984. A season that began with high expectations opened with a thud, as Warner suffered a season-ending knee injury in the first game. With Warner out and the running game largely non-existent, Knox instead turned quarterback Dave Krieg and Largent loose and Krieg responded with 32 touchdown passes — a team record until Russell Wilson broke it in 2015 — and Seattle went 12-4 despite no running back gaining more than the 327 yards by David Hughes. The 12 wins remain tied as the second-best in team history. An aggressive defense led by Easley also forced 63 turnovers, which remains second-most in NFL history for one season and is nine more than any team in Seahawks history. But while Knox could keep his team on edge during practices and games, players also fondly recall other moments when Knox showed there was a big heart underneath those omnipresent eyes. Wyman remembers when Seattle pulled off a miraculous last-play win at Kansas City in 1990 for the Seahawks’ first win there in a decade. Back in what was a different time, the team had to go through the airport on the way to their plane and with some time to kill, a few headed to bar. Knox was born April 27,1932 in Sewickley, Pa., initially thinking he was destined to a life working in the local mills until a coach at Juniata College convinced him to return to school and the football team after he had left early in his freshman season. 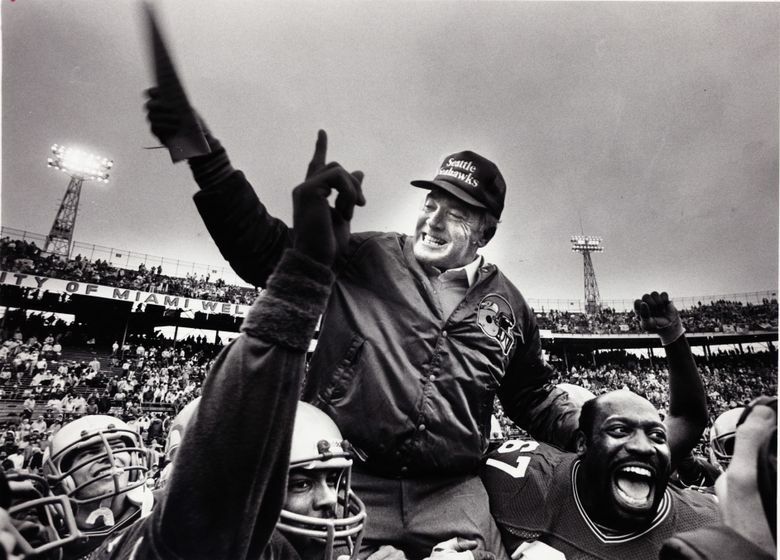 He first gained renown as the offensive-line coach of the New York Jets (1963-66) and Detroit Lions (1967-72) before being named coach of the Rams in 1973. Moyer says he thinks Knox — who was 186-147-1 overall as a head coach — is overlooked because he didn’t make it to a Super Bowl. Knox is not in the Pro Football Hall of Fame. But like many others, Moyer points to the fact that Knox never had a quarterback who was a Hall of Famer as the biggest reason his teams never made it to a Super Bowl. The Seahawks made it to the playoffs four of his first five seasons, including winning their first division title in 1988 with a final-game win against the Raiders in Los Angeles. But the season was already tinged with change, the team having been purchased earlier in the year by Ken Behring. Things were never the same for Knox in Seattle, with Behring wielding a much heavier hand over the team’s moves. Seattle missed the playoffs his last three seasons, and Knox resigned a few days after the season ended. “It’s a bummer that Ken Behring bought the team because I think if he hadn’t Chuck would have been Seattle’s coach for 20 years,” Moyer said. Knox finished his Seattle career with a record of 80-63, second in wins behind Mike Holmgren (86-74). Current Seahawks coach Pete Carroll is third at 79-48. Knox returned to Los Angeles to coach the Rams for three seasons, but the team went 6-10, 5-11 and 4-12, and Knox was fired following the 1994 season. He was inducted into the Seahawks’ Ring of Honor in 2005. Many of his Seattle players saw him for the final time when he traveled to Phoenix for the Seahawks’ Super Bowl appearance against New England in Feb. 2015. But while dementia had already begun to take a toll on Knox at that time, Wyman said “his face lit up” when he saw some of his former players. He spent much of the rest of his life in Palm Springs, Calif. Survivors include his wife of 65 years, Shirley.